Artopex Metal Combination Storage Cabinets |Artopex| Alliance Interiors Inc. Combination Storage It’s incredible just how many configurations you can design with combination units from Artopex. In a single piece of furniture, you can unite the advantages of several types of storage – wardrobe space, lateral organization, bookcase versatility and filing needs. It is important who you choose to assist you when making your Artopex purchase. Lynne Lemieux has the experience and knowledge to help you make the right choice. 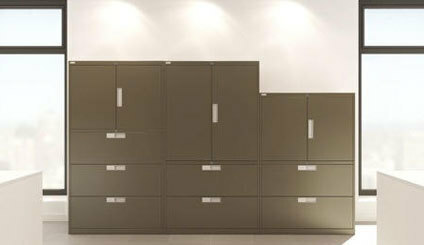 I recommend the Artopex combination storage cabinets for keeping your workplace well organized and efficient. Most of my clients prefer the Artopex Storage units and file cabinets in private offices, open areas to divide space and against walls to maximize the use of space. Artopex manufactures these metal combination cabinets in many heights, widths and combinations. This is Canadian made quality with a lifetime warranty. Here we have a 3 high lateral file cabinet with a closed bookcase unit. Next to it is a 2 high lateral file cabinet with a closed bookcase unit. Right next to this one is a 2 high lateral file cabinet with a lower height storage unit. I use Artopex Metal storage cabinets in almost all of my projects and I like the fact that I can mix and match with color finishes to give the working environment some excitement along with functionality. Give me call so I can help you with what you need.